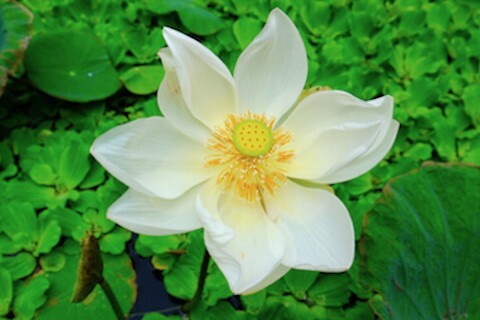 The Shambala Oceanside Villa Quan Yin on Bali is located in a tropical garden with swimming pool. The dreamlike seminar house, with small Balinese-style equipped garden villas in a tropical garden, is located directly on the sea. Each of the small villas is individually decorated with handicrafts and uniquely carved beds framed by a romantic mosquito net. Each house has its own beautifully designed bedroom and artistically designed bathroom with a double bed, writing desk, easy chair and a rocking chair on your terrace – and you will feel like you’re in a whole new world. In the garden, with a great ocean view, you can relax on sun-beds, dream and watch both the sunrise and sunset. At Shambala you can be sure to be pampered by wholesome healthy vegetarian food. While eating dreamily watch fishermen’s boats and on lucky days even dolphins may float by. All our food, including fruit or vegetable juices and salads, is washed in filtered, ultraviolet treated water and it is safe to eat it raw! We always serve teas and fruits, even at night, and you can linger to watch the fishermen go out for night fishing, dotting the ocean like a string of stars. 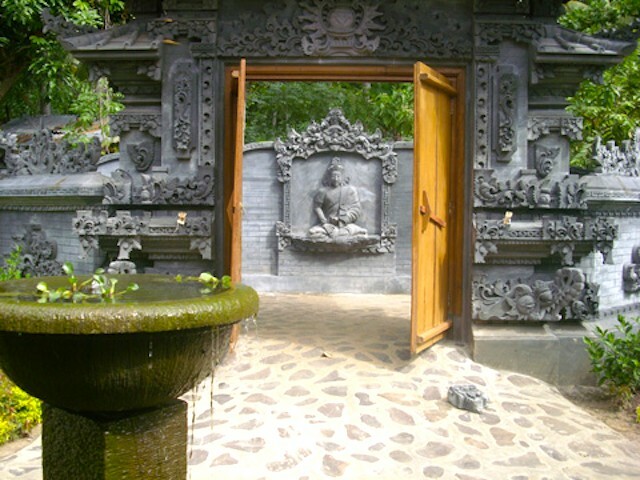 Meditation room in the garden at the beautiful Shambala Oceanside Resort on Bali at the sea. 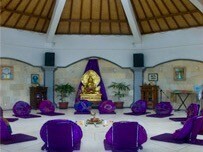 The octagonal meditation hall is surrounded by tropical nature and is located between the garden huts. It’s wonderful to start the day at dawn in Shambala’s beautiful temple with gentle yoga, and refresh your life energy in the cool morning air. You can join other participants at the swimming pool just steps away, or lounge in one of the typical Balinese Bales: a wooden structure with a rice hatch-roof giving you ample space to meet with friends or read a book and to lounge in its comforting shade. The swimming pool can also be used as a warm water pool. 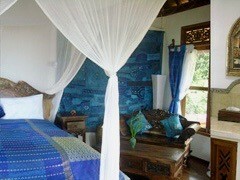 The Shambala Resort is lovingly decorated in Balinese style. After yoga, you can go swimming early in the warm sea water and let your face be touched by the glistening sunlight. The warm sea water is great for snorkelling. Free snorkelling equipment can be borrowed at the front desk. End your day under the night sky by our pool, watch the stars above the vast ocean sky or enjoy our night watchmen singing songs, while listening to his guitar next to a fire by the beach. Bicycles, kayaks and paddle boards can be rented for a small fee, a laundry service is available in-house. For a fee, WiFi in the room is available on request, a telephone is situated in the restaurant. Enjoy snorkelling in the warm, safe ocean. You can also hike to a nearby waterfall or go on an early morning dolphin tour.